Hugh M. Dorsey, solcilictor [sic] general of the Atlanta circuit, left Atlanta for New York and Atlantic City on Saturday afternoon at 2:45 o’clock. Mr. Dorsey states that he will be away from the city for a week, and is going simply to get a needed rest, and vacation from the duties of his office. He denies that his visit to New York has anything to do with the case against Leo M. Frank, who is charged with the murder of Mary Phagan. It was rumored that Mr. Dorsey would make a personal investigation of the past life of the accused man, but the solicitor states that this rumor is without any foundation. The duties of the solicitor’s office are naturally arduous, and Mr. Dorsey almost since the murder of Mary Phagan, has had charge of the active investigation of the case as well as his routine work, and as a result is greatly in need of a rest. 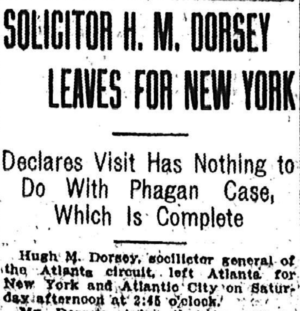 Mr. Dorsey’s absence from the city for a week is not expected to delay the trial of Frank. While he has made no announcement, it has been generally conceded that the official will set the Frank trial for June 30, and it will then depend on the defense as to whether or not a postponement of the case is asked. For the reason that the court generally do not sit during the months of July and August, it is said to be extremely probable that Frank will actually come to trial on June 30, as a postponement then will probably mean that the case will not be reached until September. The fact that the solicitor is willing to leave the city at this time is taken by those familiar with the Phagan case as an indication that at last the investigation is complete, and that all sides are simply waiting for the hour of trial to come.